We are the people that project managers confidently rely on for expert lifting and rigging work no matter the project size-scope, technical challenges or completion schedule. A#1 Crane provide a full range of flexible lifting and rigging services designed for quality performance, productivity efficiency, and cost effectiveness. Our service area encompasses Massachusetts, Rhode Island, New Hampshire, and Maine. Exceptional customer service is a company cornerstone that has earned us loyal customers and an elite status in the industry. Since 1996, we have earned a unique reputation for successfully meeting near-impossible project deadlines under the most demanding conditions. In fact, other crane companies often prefer to pass on projects that we bring successfully to completion! A#1 Crane will work closely with project managers, architects, building owners and residential clients to achieve their project objectives. Contact us for helpful suggestions and alternative ideas you may want to consider for your project. When bringing A#1 Crane in on your project, you can rest assured that we stand 100% behind our workmanship. 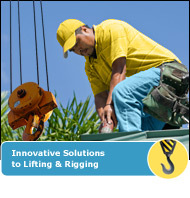 Few crane companies are as committed and dedicated to safety concerns as A#1 Crane. We consider our safety record a vital competitive advantage in acquiring projects. All of our equipment operators have completed all necessary certification courses and adhere to industry safety standards rigorously.